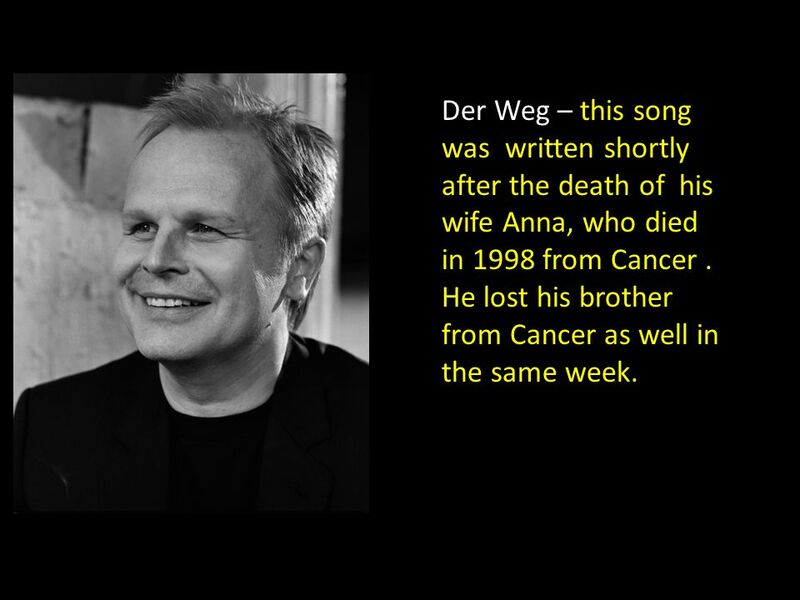 Der Weg – this song was written shortly after the death of his wife Anna, who died in 1998 from Cancer . He lost his brother from Cancer as well in. 1 Der Weg – this song was written shortly after the death of his wife Anna, who died in 1998 from Cancer . He lost his brother from Cancer as well in the same week. 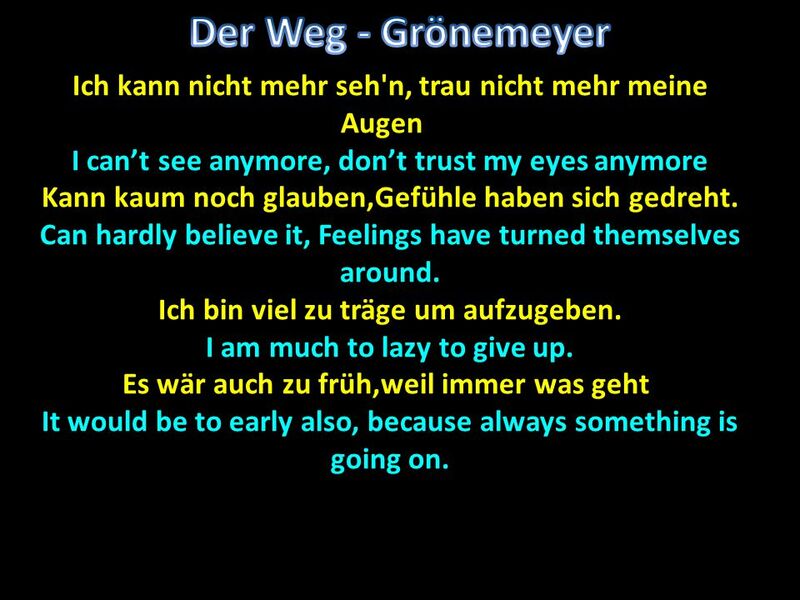 2 Der Weg - Grönemeyer Ich kann nicht mehr seh'n, trau nicht mehr meine Augenn I can’t see anymore, don’t trust my eyes anymore Kann kaum noch glauben,Gefühle haben sich gedreht. Can hardly believe it, Feelings have turned themselves around. Ich bin viel zu träge um aufzugeben. I am much to lazy to give up. Es wär auch zu früh,weil immer was geht. It would be to early also, because always something is going on. 3 Wir haben verschworen,wären für einander gestorben. 4 Wir haben uns geschoben durch alle Gezeiten. We pushed each other through all the tides. Haben uns verzettelt und verzweifelt geliebt. We frittered and loved each other desperately. 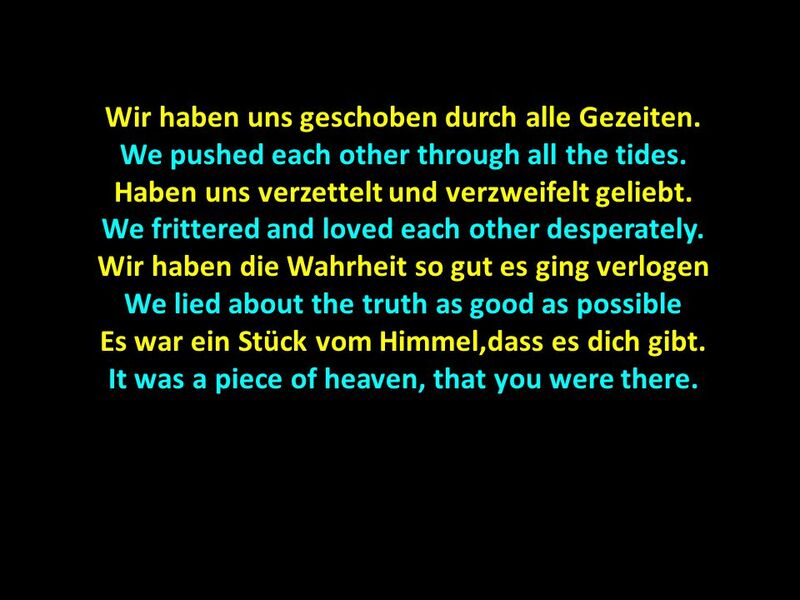 Wir haben die Wahrheit so gut es ging verlogen We lied about the truth as good as possible Es war ein Stück vom Himmel,dass es dich gibt. It was a piece of heaven, that you were there. 5 Du hast jeden Raum mit Sonne geflutet. 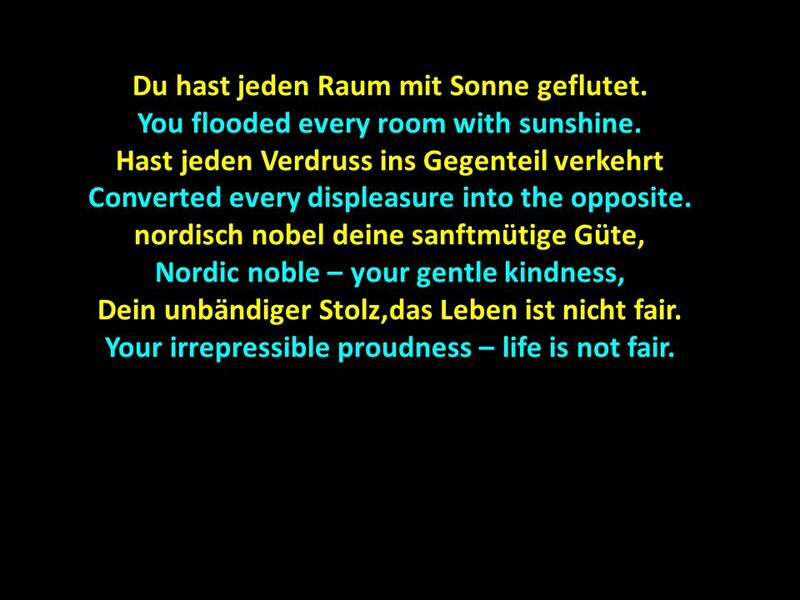 You flooded every room with sunshine. Hast jeden Verdruss ins Gegenteil verkehrt Converted every displeasure into the opposite. nordisch nobel deine sanftmütige Güte, Nordic noble – your gentle kindness, Dein unbändiger Stolz,das Leben ist nicht fair. Your irrepressible proudness – life is not fair. 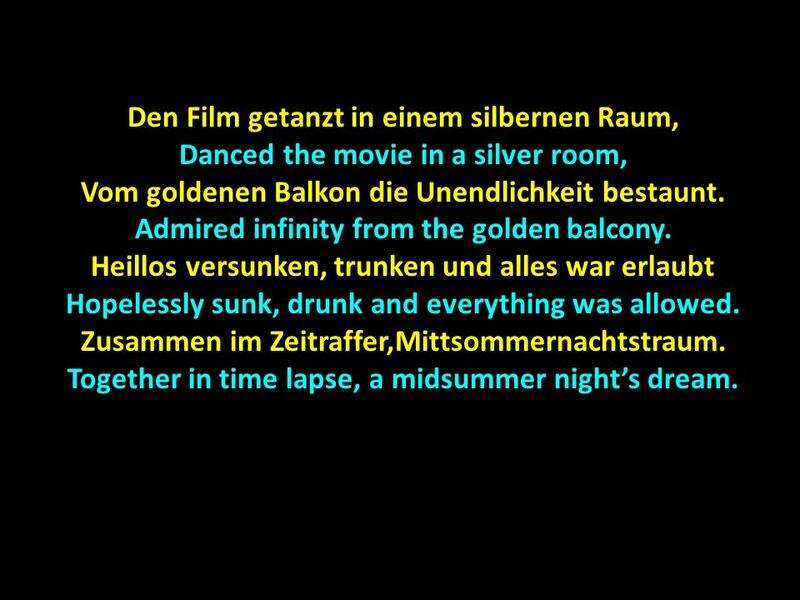 Danced the movie in a silver room, Vom goldenen Balkon die Unendlichkeit bestaunt. Admired infinity from the golden balcony. Heillos versunken, trunken und alles war erlaubt. Hopelessly sunk, drunk and everything was allowed. Zusammen im Zeitraffer,Mittsommernachtstraum. Together in time lapse, a midsummer night’s dream. 7 Du hast jeden Raum mit Sonne geflutet. Your confident pace, your true poems, Deine heitere Würde,dein unerschütterliches Geschick Your bright dignity, your unshakeable aptitude. Du hast der Fügung deine Stirne geboten, You made progress against destiny Hast ihn nie verraten,deinen Plan vom Glück, You never betrayed, your plan of happiness Deinen Plan vom Glück. Your plan of happiness. I’m not going away from here, I have lengthened my term. Neue Zeitreise,offene Welt New time to travel, open world. Habe dich sicher in meiner Seele I have you safely in my soul Ich trag dich bei mir, bis der Vorhang fällt., I carry you with me, until the curtain falls. 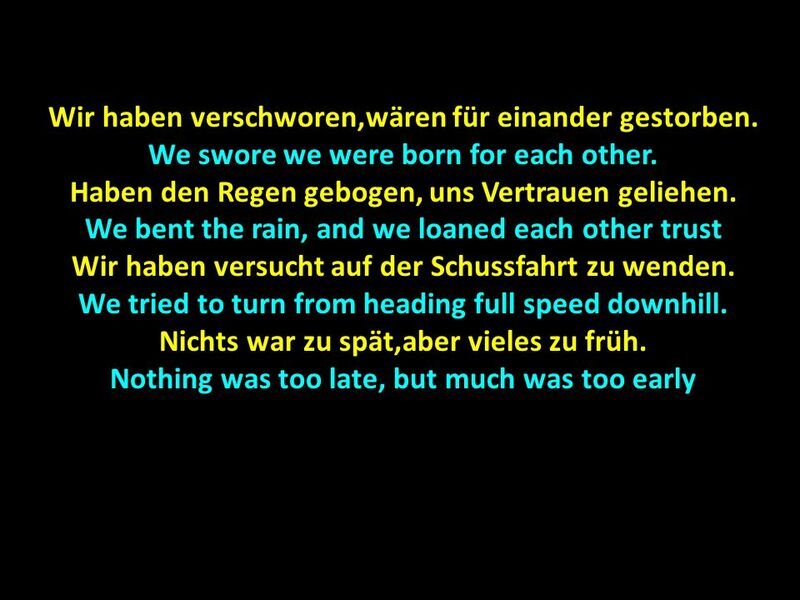 Herunterladen ppt "Der Weg – this song was written shortly after the death of his wife Anna, who died in 1998 from Cancer . He lost his brother from Cancer as well in." Immer war ich auf der Fahrt, Always I was on the go, Immer Pilgersmann, Always a pilgrim, Wenig hab ich mir bewahrt, Little did I retain for myself, Glück.